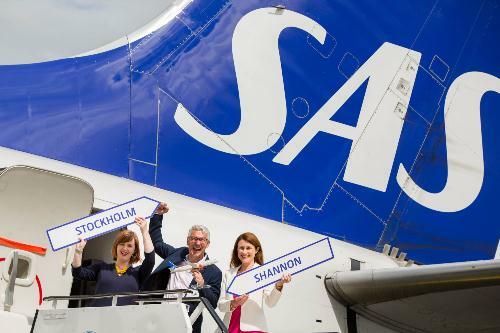 Shannon, Ireland, 2017-Aug-06 — /Travel PR News/ — Tourism providers along the Wild Atlantic Way got another boost today with the commencement by Scandinavian Airlines (SAS) of a twice weekly service to Shannon from Stockholm. The service is the first ever between Shannon and Sweden’s busiest Airport, Stockholm Arlanda Airport, and the first between Shannon and Sweden in over 12 years. It will operate for August and September, concluding on October 7th, and its addition to the schedule is further affirmation of the success of the Wild Atlantic Way and Shannon as the key gateway airport to it. Speaking following its arrival, Mary Considine, Deputy CEO, Shannon Group said: “This is the fourth new destination added to our schedule this year, adding to two new transatlantic and a Frankfurt service. The common denominator for all these is the Wild Atlantic Way, which has become one of the biggest success stories in tourism globally this decade. “Today it’s the turn of Scandinavian Airlines (SAS) to launch a twice weekly Stockholm service, which is largely driven by the demand for the very special and unique tourism product delivered here along the Wild Atlantic Way and the general Shannon catchment. It’s also further validation of Shannon as the premier gateway airport for the Wild Atlantic Way.” Said Andrew Murphy, Managing Director of Shannon Airport, “This is a further boost for tourism in this region as it gives the Nordic market, where there is a growing demand for the Irish tourism product. Visitors from there typically look for vibrant night life, top quality food, traditional music, golf, adventure, etc. This entry was posted in Airlines, Airports, Business, Flights, Hospitality, Travel, Travel Services, Travel Tips & Info, Travelers, Trips and tagged Andrew Murphy, Mary Considine, Scandinavian Airlines, Shannon, Stockholm, Stockholm Arlanda Airport, Tourism Ireland, Wild Atlantic Way. Bookmark the permalink.